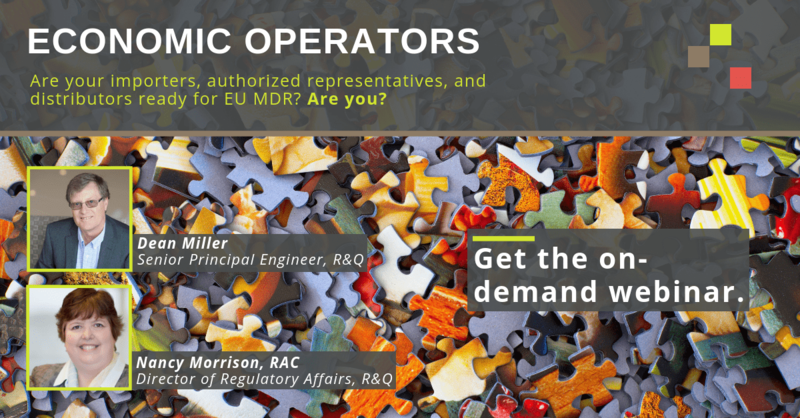 Are your importers, authorized representatives, and distributors ready for EU MDR? Are you? Are they ready for EU MDR? Are you? This webinar was originally presented in November 2018 and is now available on demand. The EU MDR extended the responsibilities of those who handle your information and product, and require you have new systems to interact with them throughout the process. In this webinar we will cover the requirements for authorized representatives, importers, and distributors. We'll also cover what you as the manufacturer need to do to ensure that these entities are prepared and ready for implementation. Your role as a manufacturer doesn’t end with just the release of finished goods. You will have to have document exchange in place. Label approval is no longer just an internal process; your economic operators have responsibilities too. You have to share not just product, but information – regular training and updates are required. Authorized representatives have product liability under the EU MDR and if your authorized representative has been passive in the past about reviewing documents they probably won’t be in the future. Options for managing push back or differences in opinion on complaints, technical documentation, and labeling between the manufacturer and economic operators. How to create a quality agreement that defines and explains roles and responsibilities. Authorized representatives need to have a person responsible for regulatory compliance. This webinar was originally presented in November 2018.